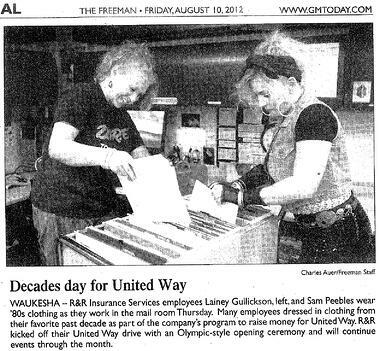 Our very own Lainey Gullickson & Sam Peebles made the Waukesha Freeman as part of "Decades Day" supporting the United Way. Employees were encouraged to dress from their favorite decade to raise money for the United Way. In her "rad" 1980's outfit, Sam was our lucky winner and received a $10 gift card to QuickTrip! Congratulations, Sam! In the words of Ken Riesch, "Success is shared". From United Way to local sports and charities in Waukesha, West Bend, Menomonee Falls and Beaver Dam and communities all throughout Wisconsin, we take great pride in our community support. Management emphasizes the importance of community involvement by encouraging volunteerism amongst our employees and offering a flexible workplace environment to do so. This loyalty to people, families, friends and business associates is key to our success.